Dayan Viciedo #24 of the Chicago White Sox. Just before Saturday’s game against the Minnesota Twins, the Chicago White Sox recalled Blake Tekotte and placed outfielder Dayan Viciedo on the 15-day disabled list. Tekotte, 25, was reinstated from the disabled list Friday after sustaining a strained hamstring at the start of the season. He was picked up by the White Sox from San Diego in November 2012 in exchange for pitcher Brandon Kloess. 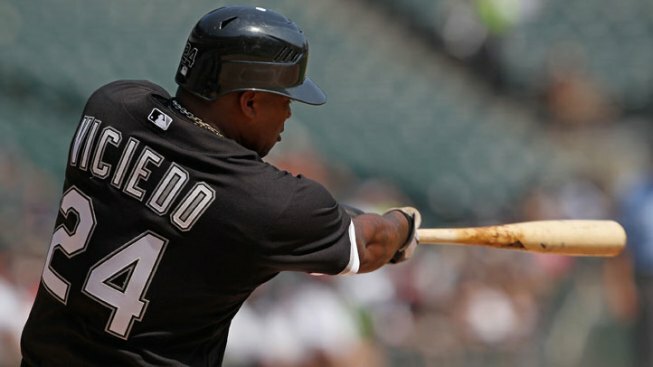 Viciedo suffered an oblique injury in Thursday’s game in Toronto. He left the game in the eighth inning with apparent soreness in his left side after swinging and missing on a pitch from Blue Jay’s pitcher Esmil Rogers.